We have advertised this property on Home Away for the past sixteen years, since 2003. We proudly share again the following message. This beautiful architect designed VILLA DELLE PALME, owner's holiday residence, is ideal if you want to stay away from commercial properties. It is available year round for weekly rent. It offers a Garden Suite (Home Away, advert #9100) and a Terrace Suite (Home Away, advert #8398) that can be interconnected to accommodate larger groups. The GARDEN SUITE (advert 9100) with its unique style and comfort will surprise you to an unforgettable holiday. It is exquisitely furnished with antiques and family heirlooms. 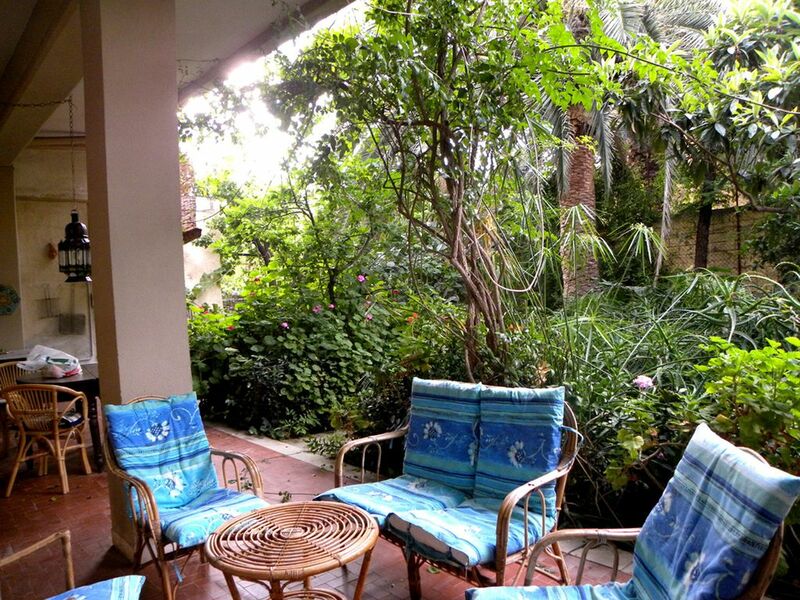 In the evening you will relax in the shade of the secluded subtropical garden. You will feel free to move in and out from the covered patio and the luscious garden to the intimate and comfortable living room. In this Suite we can accommodate up to 8 guests and a total of 10 guests with additional beds. It includes up to four bedrooms (and a fifth bedroom if available) on two floors; 3 washrooms; living; dining; kitchen; fully furnished covered deck with exterior cooking facility, eating and barbecue and, of course, access to the subtropical garden, shared with the owners. The TERRACE SUITE (advert 8398) is located above the Garden Suite. It has independent exterior access overlooking the subtropical garden. This section is perfectly sized for your romantic holiday. The fully furnished large decks (60 square meters) are covered with traditional logs and clay tiles, perfect for indulgent candlelight dinners while you relax at the breeze of the sea and enjoy the view of the mountains and the nearby town, after a day of sightseeing. You would then catch your dreams in the most comfortable custom-made beds and 100% cotton linen. You will enjoy the vaulted ceilings, the original oil paintings on the walls and the birds and cherries hand-painted on the new custom-made cabinets of the kitchen area. In this Suite we can accommodate up to 5 guests (7 guests with additional beds). It includes up to two bedrooms (and a third bedroom if available); 1 ½ washrooms; exterior shower; living and dining; fully equipped kitchen including D/W; 2 furnished covered decks with exterior sitting, eating, cooking and barbecue facility. In either suite of villa delle Palme you will find custom-made beds; HIGH SPEED INTERNET; a WALL SAFE, should you wish to have extra protection for your jewels and valuables; 100% COTTON LINEN to insure you the best comfort while you sleep; Sicily MAPS and GUIDES in English, a treasure of information for your explorations; at your arrival you will find a SUPPLY OF SOME OF YOUR BASIC NEEDS, such as a complimentary cold bottled water, sugar, salt. WASHING MACHINE, soap, iron and iron board are available at no charge. CENTRAL HEATING, at no charge, will make your winter stay comfortable. On request, during summer, A/C is available in each room. Use of barbecue, griddle, deep-frying and smoking on covered patio or terrace only. Laundry deck is shared by guests and the owners. Both suites can be interconnected, and can be rented together to accommodate larger groups. The garden is reserved for the guests of the Garden Suite and the owners. This villa is located in the heart of Casteldaccia, a quaint, lively at times, village on a Sicilian hill, two km from the sea and 20 min. easy drive to Palermo. The location offers all the best. Placed in the center of the town, not freestanding and detached from the other houses, our home overlooks an intimate garden, while at the same time it offers you a taste of local life and easy walks for your shopping. Excellent is the local production of wine. Don't forget to taste the world renown 'Corvo, Duca di Salaparuta'. Freeway connection, located 200 meters away, will allow you to quickly connect, explore and discover remote areas of the island. Sicily is the largest and most important island in the Mediterranean, it extends for 25,460sq km. Planes of fertile red soil, excellent for the cultivation of vine grapes, citrus orchards and olive groves, alternate with hills, green in spring for the cultivation of wheat and, among the majestic mountains, Mount Etna, the most popular of active volcanoes. The climate is typically Mediterranean along the coasts, with mild, short winters and moderate rainfall. Palermo, 1.500.000 inhabitants, capital of Sicily – an island in the sea of sunlight – is a splendid city adorned in the course of 2500 years by Greeks, Arab Emirs, Norman Kings and Spanish Viceroys; it offers an incomparable example of beauty, history, culture and traditions to excite the mind and the eye. It has a wide selection of museums and entertainment. Casteldaccia is well connected to Palermo by freeway and by public transportation. Close-by centers are: Santa Flavia and Solunto, with its Graeco-Roman archaeological site, 3 km west; Bagheria, an active and very alive town, ideal for elegant shopping, with its seventeenth century mansions once summer retreat of the Palermitan aristocracy, 5 km west; Porticello, a delightful fisherman village, 3 km west; Aspra, another unspoiled fisherman village, 5 km west; and Altavilla, with its Sanctuary to the Holy Mary, 2 km east. All are offering plenty of tourist attractions. Casteldaccia is east of Palermo, so you will be closer and will not meet the city traffic when driving for a day trip to Cefalu`, Taormina, Mount Etna, Siracusa, Agrigento, Selinunte. We recommend excursions to: Palermo e Monreale (20 km), Cefalu` (50 km), Segesta, Agrigento, Madonie Natural Park (80 km), Taormina (200 km), Mount Etna (200 km), Siracusa (250 km), Eolie Islands. Many thanks for our great week at your villa and in your Sicily. One of our best trips. How can I possibly thank you enough for your kindness and care during our stay in your wonderful villa. It was such a nice time here and I enjoyed it tremendously . I am sorry I was such a pest and required special attention, but at least that way we got to spend more time together. The garden is a wonderful place to relax and recover. I have taken some picturesof the garden, but I will not need pictures to remember your home and my time here. We enjoyed your Casa so very much. Because of our unexpected limitations on travel I was able to truly enjoy the lovely gardens and just relax there. your casa is so very welcoming & comfortable. it soon began to feel like 'home' to me. Thank you for allowing our group of seven to stay in your lovely home. You were the best hosts, helping us with everything from medical assistance to recommendations for the best pizza in town. We are going to miss your wonderful garden. Jaqueline O, Magda K, Dora K, Mollie K, Laura D, Raffaele C, Lorenzo R, Erika D.
Thank you so much! It has been wonderful. We didn't want to disturb you to say goodbye. We will think of you with great pleasure and wish you all good things. John R, Suzanne R, Ursula S, George D, Angela D, Mattew R, Sarra R, Jauquin S, Dillon S, Ada S.
Magnificent Villa. Friendly locals. Had a great time exploring the town/area. Maria and Riccardo were fabulous hosts. I'm from Australia and my wife is a kiwi (New Zealander) over here for a long holiday. We met up here with my brother and sister from Wales & England respectively. Maria & Riccardo, you added so much to our stay - molto gentile! The villa is a heaven and Sicily is a treasure trove. •History in heritage sites and experiences like ricotta making the old way! • Culture - Casteldaccia and surroundings. Sandra H, Bruce H, Sue C, Liz G, Dorothy H.
We came & fell in love with Sicily's wonderful mountain scenery, exquisite spring flowers & enjoyed friendly helpful people. One highlight was a scenic trip round the mountain which Caccamo at its centre to the east of Casteldaccia. Strong climbing shoes required! Nearby is Porticello a quaint fishing village where you can buy fresh fish & walk along the promenade. Not far away at St Flavia is a spectacular walk (concrete path) ending at the disused Lighthouse. Excellent, cheap train service to Palermo. Strongly recommended instead of driving. A comfortable , elegant house with a delightful garden and as artists we enjoyed & appreciated the many art books. The house, built in 1965, was my first project after I graduated in Architecture! Every year I return with my family to this house and to Casteldaccia to restore my energy and get in touch with my roots. For 10 years, during summer, I ran in the garden a ‘Scuolina’, a free Art School for the children of Casteldaccia and nearby towns, teaching drawing, painting and ceramics. My home is located off the main road of Casteldaccia, at walking distance from all the stores. At the same time allows me to retreat at home in the paradise of my subtropical garden. Casteldaccia is close to Bagheria, a larger town, where I can go shopping, and still enjoy the fresh air of the countryside. Palermo, the capital of Sicily, is only 20 minutes away from my reach, with its history, culture and traditions, restaurants, museums, churches, squares. The Garden Suite in Villa delle Palme has high ceilings, cable TV, stereo/CD player, air conditioned on request. The kitchen is fully equipped with all you need for gourmet cooking and have a supply for your basic needs. It is furnished with love and care to the smallest detail and includes dishwasher, fridge, four-burners stove with oven, microwave, all the utensils and basic supplies. Coal barbecue unit and exterior burners allow you to barbecue, griddle or deep fry on covered patio. In the house you will find fresh bed and shower linen as well as soaps for shower, dish, dishwasher and laundry. Clothes washer is available at no extra cost. It is located on the laundry deck. We have provided you with a wall safe, should you wish to have extra protection for your jewels and valuables. The garden is reserved for you, as guests of the Garden Suite, as well as for the owners. Very cozy place in the center of Casteldaccia and we really enjoyed our stay in the summer. We had a car to travel around, to the beach in Casteldaccia, Cefalu, Bargeria, and the train station, from where we took the train to Palermo. The place was clean and the tiles/ pottery used in the house were very nice. We especially liked the animal zoo tiles in the 1st floor bedroom, where our daughter stayed. We recommend the place for a relaxing holiday. The property is located in a small town and it looks quite ordinary from the street, but as soon as you cross the gate you fell like walking into a different world. There is this amazing big garden and the villa is a very uniquely designed and decorated. We arrived in a very early morning hours but the owners waited and greeted us on arrival. The accommodation is very spacious and there is this big roofed terrace with separate shower and dining area as well as barbecue and outside lounging set. We spent amazing time in there. The villa is located close to various restaurants, supermarket, bakery and patisseries where you can get all the traditional sweets and of course gelato. The owners- amazing people- friendly, helpful, very hospitable. I hundred percent recommend the place. Thank you so much for your kind words and comments about your stay at our place in Casteldaccia. It was a pleasure to meet you and hope to see you again in the future. We will be here! The Garden Suite was a fantastic home base while exploring northwestern Sicily. We loved the apartment and the garden; it was great to have a nicely equipped kitchen in which we could enjoy morning coffee and pastries from lovely pasticceria across the street. Parking our rental car was easy, and the train station from which we did day trips to Palermo was a 15-20 minute walk. All of our questions were promptly answered by the apartment manager. We would definitely stay here again. When researching for a place to reside whilst staying in Sicily this summer, one of the aspects that really helped this beautiful hideaway stand out (besides the price! ), was the consistency in the reviews. All I can add is that every kind word said is absolutely true, from the deceptively simple entrance to the stunning garden and home hidden within. We stayed for 6 nights and from the moment we arrived, felt right at home and ready to relax! The house had absolutely every amenity we required in abundance, everything worked well (including outdoor hob's and barbeque), and children had more than enough space to play, explore and make trouble! Thanks to Maria, Ricardo, Carlo, and Alessandra for all the help, advice and tips about the area. We enjoyed some lovely meals together, and even went to buy some fresh sardines and mussels with Ricardo one fine morning, at the weekly market in Bagheria. The only bad note was having to leave before we seen everything. Oh well, we will just have to go again! What a wonderful oasis! Maria is a wonderful and gracious host. The garden is truly spectacular and the house is beautiful. This is the perfect spot from which to explore Sicily. We had an extremely lovely stay at Maria's place in Casteldaccia. From the outside, it looks like all the other houses and you would not know that there is a lush garden oasis hidden behind the doors. The garden space stretches down the whole block and is like being in your own private botanical gardens! It was so lovely to sit in the garden or start the day with some fresh coffee on the patio (with some fresh bread from one of the nearby bakeries of course). The house itself is quite nice and has lots of space, intriguing decor, and all the essentials needed for a home base. All the basic shops you would need are nearby, within walking distance. The local beach (short drive) is quite beautiful and there are other spots to swim in the area. We did a couple beautiful day trips north of Palermo while based out of Casteldaccia. Overall, we had a truly wonderful time and hope to get to return some day. VILLA DELLE PALME is located in the heart of Casteldaccia, a quaint village on a Sicilian hill, two km from the sea and 20 min. easy drive to Palermo. The location offers a unique setting. Not traditionally placed in the country, this villa is not isolated, but placed in the center of the town, melted among the town houses. You enter a portal and are placed in a magic intimate garden, while at the same time retain a taste of the local life, easy shopping and leisure walks. Excellent is the local production of wine. Don’t forget to taste the world renown 'Corvo, Duca di Salaparuta'.